You are at:Home»Learn & Live the Faith»Apologetics»Are Traditionalists Guilty of Heresy? The Year of Faith is in full swing, a year during which the Holy Father is encouraging the faithful to undertake an exploration of the Council documents with renewed vigor. Bravo! The simple fact that far too few among us have actually taken the time to read the conciliar texts is one of the primary reasons why there is so much discord surrounding Vatican II and its implementation. Pope Benedict XVI has arguably made the matter of conciliar interpretation, as articulated in his now famous Christmas Address to the Roman Curia dated December 22, 2005, the centerpiece of his papacy. It would be naïve, however, to believe that doing so is possible without great effort; as if all one really needs to do in order to pave the way for that elusive “new springtime” in the Church is to pick up the Council documents and to heed their exhortations as if following a simple road map. The fact of the matter is that people of goodwill can, and many do, find the language of the Council less than clear as it relates to its place within the tradition of the Church. To further complicate matters, even the Holy See now acknowledges that the post-conciliar Magisterium has yet to adequately address the resulting confusion. 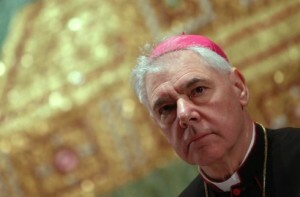 Enter the Vatican’s new Prefect of the CDF, Archbishop Gerhard Muller who, according to a recent article in L’Osservatore Romano, appears to imagine that the conciliar documents and the magisterium that sought to explain them impeccably transmit the sure doctrine of the Church with the kind of precision that leaves little room for ambiguity with respect to the Church’s venerable tradition. With all due respect, I find the rather indiscriminate suggestion of heresy as it relates to the Society, especially given that it is the Curia’s “chief doctrinal officer” who is speaking, deeply troubling. According to the Code of Canon Law, “Heresy is the obstinate denial or obstinate doubt after the reception of baptism of some truth which is to be believed by divine and Catholic faith” (Can. 751). While it’s easy to understand how this label may properly be applied to many a devotee of the progressive cause, it’s not immediately clear how this is the case with regard to traditionalists. In fact, if one accepts that the SSPX is the primary group in question, the two are cut from entirely different cloth. Everything that the Second Vatican Council proposed relative to that “truth which is to be believed by divine and Catholic faith” was but a re-articulation of that which had been clearly defined by popes and councils past. Based on interviews that I’ve conducted with members of the SSPX, which recently included a number of very candid, one-on-one conversations with their leadership (including Superior General, Bishop Bernard Fellay); far from being heretics, all indications are that these men would willingly die a martyr’s death to defend said truth! So, what are we to make of the suggestion that traditionalists are guilty of “an heretical interpretation” when they vigorously uphold the tradition of the Church as it was articulated, with neither confusion nor ambiguity, in the centuries leading up to the Council? Would this not be an indication that the accuser has fallen precisely into the trap that Cardinal Ratzinger warned against? Further troubling is that Archbishop Muller speaks of the content of Vatican II and its “authentic intentions” as though they are one and the same. The reality is that they are not. Concerning the intent of the Council, one need only explore the text of Pope John XXIII’s Opening Address to conclude that Vatican II has failed to accomplish – at least up to this point in time – the goal that the Holy Father set before it. This realization is unavoidable, not by way of interpretation, but simply as a matter of observation. It has often been said that half-a-century is but a drop in the bucket as it relates to the fruitfulness of a given ecumenical council. I used to buy into such arguments, but no longer. Those earlier ecumenical councils, which met at times of considerable crisis; were charged with passing judgment on unsettled theological issues of great importance; and which ultimately issued solemn doctrinal definitions and condemnations (as in the case of the Council of Nicaea), cannot be compared to Vatican II. For one, the Church in the late 1950’s was not in the midst of a doctrinal crisis; rather, she was enjoying a period of relative peace and calm. The Church was thriving in many places. This particular council was charged with the relatively simple task of re-articulating the doctrine of the faith in an ever more understandable way, applying these timeless truths to the realities of life as we know it. That’s it. Its decrees have since been translated and disseminated the world over, just as the Magisterium that followed, and yet, fifty years later we’re still trying to decipher them. It is further noteworthy that the text of this council is unlike that of councils past. “There were no short position papers or judgments, no sharp formulations of belief and discipline, and very little normative language,” he continued. In other words, the text of Vatican II lacks, in places, the preciseness that has been the hallmark of all of the great ecumenical councils of the Church. As any parent instinctually knows, offering instruction without clarity is a recipe for bedlam. This is true whether we’re discussing the children in our own home-sweet-home, or life in the House of God. In order for our examination of the conciliar text to be fruitful, I firmly believe that we must remain ever diligent in avoiding the “superdogma” mindset that Cardinal Ratzinger warned against. That means exploring the documents of the Council with eyes opened wide, thanking the Lord for the richness and beauty contained therein, yet willing to admit of their imperfections and shortcomings when we encounter them, measuring any and all ambiguity there present against the clear-cut, sharp formulations of belief and discipline that preceded it. It is for this reason that Archbishop Muller’s condemnation of those who seek refuge in the stronghold of tradition – even going so far as to invoke the “H” word – is so deeply troubling. It appears as though the Prefect is of the mind that the documents of Vatican II are impeccable representations of the Catholic faith in and of themselves. I sincerely hope that I am misreading his intent, but if that be the starting point for a journey into the conciliar text, good luck arriving at that new springtime. Such an document the coming from CDF condemning traditionalists is not only troublesome but also chilling. I wish he can be replaced.